Religious parents never fail by devout prayer to consecrate their children to the Divine service and love, both before and after their birth. Some amongst the Jews, not content with this general consecration of their children, offered them to God in their infancy, by the hands of the priests in the temple, to be lodged in apartments belonging to the temple, and brought up in attending the priests and Levites in the sacred ministry. It is an ancient tradition, that the Blessed Virgin Mary was thus solemnly offered to God in the temple in her infancy. 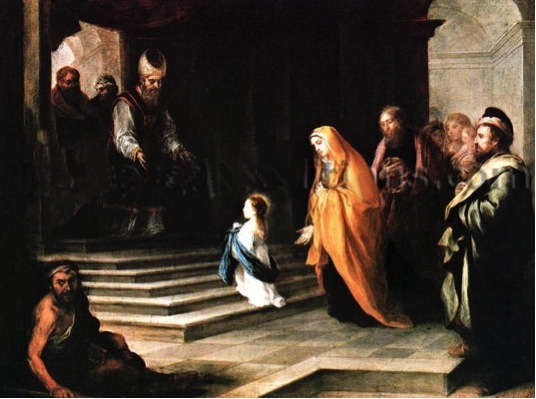 This festival of the Presentation of the Blessed Virgin, or, as it is often called by the Greeks, the entrance of the Blessed Virgin into the Temple, is mentioned in the most ancient Greek Menologies extant. Ejaculatory Prayer:Sovereign Queen, take my soul in Your hands, and transform it completely into Will of God.